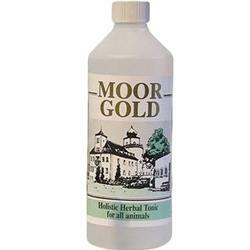 Moor Gold tonic liquid is an extract from the Pelloidic lowland moorlands of Central Europe. It is a Herbal tonic used to normalise the metabolism, gives energy to lethargic dogs and supports natural immunity. Suitable for a wide range of animals and birds. Available in 500ml and 1000ml bottles. Been giving this to one of my Chi's to try to improve his appetite. So far so good. Would recommend Doghealth they are helpful & give good service. I have used more gold for many years in the past, and now come back to it. I find that my birds have benefited from its us in the drinking water. I hope to carry on using this in the future. Very good service and very good delivery. Good product.